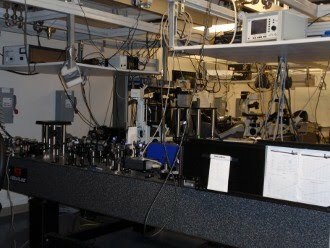 This unique, custom-built nonlinear optical microscope can take confocal images of individual cells or tissue section based on intrinsic chemical contrast provided by molecular bond vibrations. 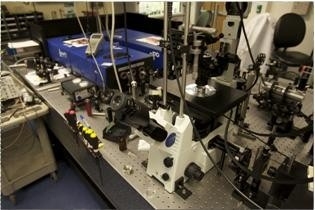 The coherent anti-Stokes Raman scattering (CARS) microscopes operates either in point-scan and/or spectroscopy mode. The primary laser source consists of a 10W, 76 MHz, 1064 nm, 7ps Nd:Van pump laser (HighQ laser, Austria), the output of which is sent through an electro-optical modulator (Conoptics, Inc.) that allows for pulse-picking to arbitrary repetition rates. It is then split between two optical parametric oscillators (OPO “Levante”, APE Berlin, Berlin, Germany), which can be tuned to provide 6 ps pulses at 1.5W in a wavelength range from 770 nm – 960 nm. After combining all laser beams, they can serve as pump source for one or both CARS systems. The point-scan system consists of an Olympus IX71 microscope frame with differential interference contrast for cell viewing. Its 60x, 1.2 NA water objective, optimized for near-IR operation, can be scanned over a 100 µm x 100 µm area to produce confocal multi-photon or CARS images. Scan control of the xy piezo stage (Polytec PI) is achieved by SymPhoTime software (Picoquant GmbH, Berlin, Germany), which is also used to detect the output of 2 single-photon counting avalanche photodiode modules (SPCM-AQR-14, Perkin-Elmer) through a 4 channel router (Picoquant), and TimeHarp200 time-correlated single photon counting board. The software provides capabilities for 1D, 2D, and 3D scanning, point-spectroscopy, time-correlated single photon counting (lifetime measurements), and correlations between arbitrary channels.